Frank Buckley is a professor at the Antonin Scalia Law School at George Mason University, Brian Lee Crowley is the managing director of the Macdonald-Laurier Institute and Sean Speer is a Munk senior fellow at the Macdonald-Laurier Institute. Donald Trump’s recent attacks on Canada and Prime Minister Justin Trudeau have generated considerable media and political attention. The reaction has been swift. Journalists have called for sanctions against the President. The city council of Halton Hills, Ont., passed a motion to encourage residents to avoid U.S.-made goods. Foreign Affairs Minister Chrystia Freeland’s recent undiplomatic speech in Washington warned about “angry populism,” the rise of “strongmen” and the United States’ seeming withdrawal from the rules-based international order. Canadians have reason to be frustrated by the U.S. administration’s tariffs and the President’s and his aides’ over-the-top rhetoric. That the Trump administration seems to be targeting Canada is eminently “dumb,” as one of us has written. But while anger or exasperation may be justified, bewilderment is less so. Ms. Freeland’s expression of “astonishment” is common among some policy makers and policy commentators. Canadians seem genuinely surprised that the President is challenging many of the basic precepts of post-Second World War internationalism. Mr. Trump may not fully understand the game either, but he’s certainly sought to play his cards differently than his predecessors in the first roughly year-and-a-half of his presidency. National Post columnist Andrew Coyne has called it “unprecedented.” He’s not wrong. And this has enormous implications for Canada. Canadian officials would thus be wise to understand the extent to which the President’s actions reflect a purposeful recalibration of postwar international arrangements. And it’s not likely to begin and end with him. These trends will continue post-Trump given the United States’s evolving geopolitical and economic interests. Canada will need to be ready rather than astonished. Remember, 20 per cent of our economy depends on exports to the United States and less than 2 per cent of their economy depends on exports to us. We can’t afford to get this wrong. It requires a lot of someone to ask that he or she set aside the President’s weaknesses. But it’s important for Canadian policy makers to separate him from these larger trends. The game is changing, and we’ll need to be able to effectively play any hand we’re dealt. As Mr. Kagan describes this bargain, the United States essentially became the main provider of security and peace in Europe and East Asia following the Second World War in exchange for global stability and an impediment to Soviet expansion. There was also an economic dimension. The United States would subsidize welfare-state spending among its allies by assuming a disproportionate share of military and security costs and support their economies by accepting asymmetrical economic relationships. This “enlightened” model became the foundation of the post-Second World War liberal order. The model has long outlived the late and unlamented Soviet Union. Subsequent administrations reaffirmed their support even though the global context had changed, and the United States’ resources and capacity became scarcer. That the “grand bargain” should persist was simply taken for granted. Even now the United States spends more on its military than the next eight countries combined. This will not continue. Mr. Trump is challenging the idea that the trade-offs inherent in the “grand bargain” are still in U.S. interests. He’s fed up with asymmetry on inputs combined with symmetry in influence. One can certainly argue that he’s wrong or that his administration is mishandling these issues. But the questions he’s asking aren’t at all unreasonable. 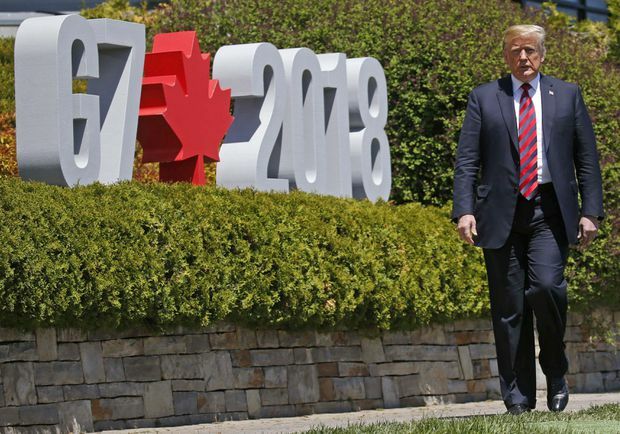 U.S. President Donald Trump arrives at the the G7 summit in Charlevoix, Que. The United States contributes nearly one of every four dollars of the United Nations budget. It provides nearly one-quarter of NATO’s budget, and its defence spending as a share of GDP is roughly twice as high as NATO allies such as France, Germany and Canada. Its share of the World Trade Organization’s budget is nearly 40 per cent higher than the next largest country. The list goes on. Is the United States getting value for this spending? Are these institutions still the best means of advancing American interests? Mr. Trump’s “America First” model, which has majority public support, says no. It thus proposes to replace the notion of “American leadership” of a largely consensual alliance with a rawer exercise of national interest. This doesn’t necessarily mean isolationism. But it unambiguously involves a narrower conception of American interests and the United States’ role in the world. We’ll likely see more ad hoc arrangements in U.S. foreign policy rather than permanent international institutions or structures. We’ll also likely see more utilitarian or realist engagements with different countries on an issue-by-issue basis. Ironically, it seems to mean higher U.S. defence spending as Washington prepares to confront the world alone if need be. Think of it as a new transactional foreign policy. The point isn’t to condone or condemn the White House’s approach but rather to highlight what’s occurring and set out how Canadian policy makers should respond. We must recognize that this is something different and act accordingly. What does this mean for Canadian policy? This means that Canadian officials must similarly become much more focused and hard-headed. Rhetorical appeals to the past won’t work. Nor will tangential issues or lamentations about the economic effects of tariffs on Canadian businesses or workers. The truth is the Trump administration just doesn’t care. It also isn’t going to be moved by “retaliatory” measures. Enacting matching tariffs will harm Canadian businesses and consumers and escalate tensions with the U.S. government. It seems just as likely that Mr. Trump is emboldened by retaliation rather than dissuaded. The result would be an escalation of protectionism and higher costs for businesses and workers that would harm us far more than our neighbours. Cutting off your nose to spite your face is poor policy, however satisfying it may feel. There’s also scope to follow Andrew Coyne’s prescription and pursue a pro-competitiveness agenda. One trait that seems to impress Mr. Trump is strength. Canada should seek to outcompete the United States for investment and product mandates through lower taxation, less regulation, stronger IP protection, more human capital and so on. As a starting point, this could involve co-operation between the Trudeau government and the provinces (especially the incoming Ford government in Ontario) to rethink Canadian corporate taxation in all its aspects in order to restore a competitive advantage for Canada. A final area is to leverage Canada’s growing trade network so that we’re less exposed to U.S. policy choices, although the hard truth is that we’ll always be next door to the Untied States and oceans way from any alternative trade partners, and Canada is inextricably part of the North American economy. Still, the Canada-EU free-trade agreement and the newly-signed Trans-Pacific Partnership (subsequently retitled the Comprehensive and Progressive Agreement for Trans-Pacific Partnership) open the doors to new markets. But there remain impediments – namely the policy and legal uncertainty for energy infrastructure. The Kinder Morgan episode has once again demonstrated the difficulties of transporting Canadian energy exports to non-U.S. markets. Canada will continue to sell our energy resources for billions of dollars below world prices until we have the capacity to ship our products elsewhere. Before, this was painful and annoying. Fixing it is now imperative. Recent tensions between Canada and the Trump administration have jolted Canadian officials and commentators to the fact that the United States is moving toward a new model of global engagement rooted in unabashed self-interest. Many who are accustomed to the United States assuming a major share of resources and responsibilities are astonished. But they shouldn’t be. That game is over and may never resume. The deck has been reshuffled. Canadian policy makers need to be ready to play their hand on behalf of Canadian interests.